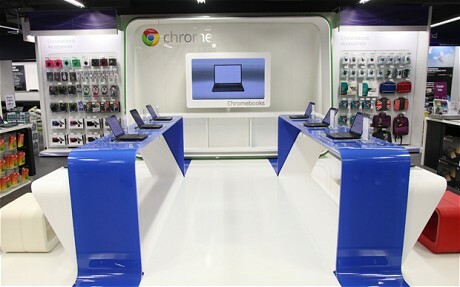 Google has recently opened its first retail store in UK, which are for primarily selling the Chromebooks. The store is located in the PC World in London’s electronics-friendly Tottenham Court Road. According to Arvind Desikan, Google’s UK consumer marketing head, as he stated on the London Evening Standard that the store will be mainly selling notebooks, especially those which are powered by the new Chrome OS. He also added that in their store when people tried the device and played with it, that made a huge difference to their understanding for the Chromebooks and they want to see whether people understand what this device is all about and they even monitor their reactions while the customers try them. Google even plans to broaden this approach and will be opening mini-stores in other areas also. They are planning the next store to open at Essex a week later, which will later be carried out worldwide. However, Desikan didn’t mention anything about, if Google would open its own fully independent store which may also include Android devices. Till now Google have never reported about the sales of the Chromebooks, though they are thought to be modestly successful. As the Chromebooks are mostly sold online, so a lot of customers who likes to inspect physically and feel the experience of using the device are not included in Chromebooks list of customers. But now with these stores these devices are given much exposure to the customers.